These ingredient packs are all you need to make a stout, ale, or IPA with a PicoBrew. Each is made from a recipe from a popular craft brewery to give you the same delicious results at home. Yields an ale inspired by the style of a German Maibock. Dead Guy Ale is deep honey in color with a malty aroma, rich hearty flavor, and a well-balanced finish. The quality of the ingredients is to notch, and the pico packs offer numerous craft beer recipes for the brewer. The hardest part might be picking which PicoPak to brew first. Each pod uses a recipe from popular craft breweries and contains the pre-measured hops, grain, and yeast needed to make an IPA, stout, or ale. 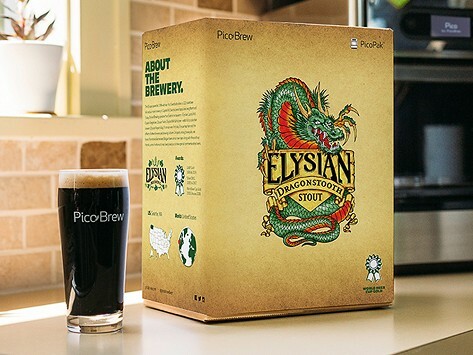 Pop one in, and the PicoBrew takes it from there. After 2 hours of brewing in the machine and then a few weeks of fermentation, you've got your own brew.